In order to be able to see and explore the logical models calculated by Sonargraph (See Section 4.4, “Logical Models” ), users can rely on the Master view called Namespaces view. 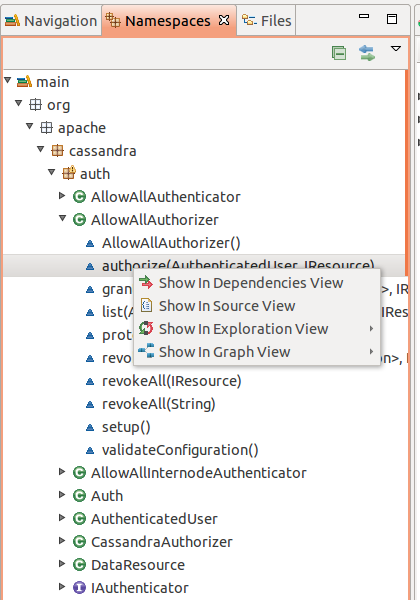 As shown in figure “Namespaces View” , the logical elements that appear in Namespaces view also offer interactions for exploration and source code visualization when it is the case. 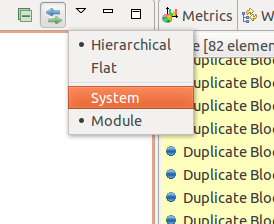 Besides choosing which logical model to see, the Namespaces view also offers the possibility to change the logical namespaces presentation from flat to hierarchical and vice versa.